Absolutely every body can start a yoga practice. And it doesn’t require an extraordinarily flexible or strong body to develop a solid foundation for a new yoga routine. 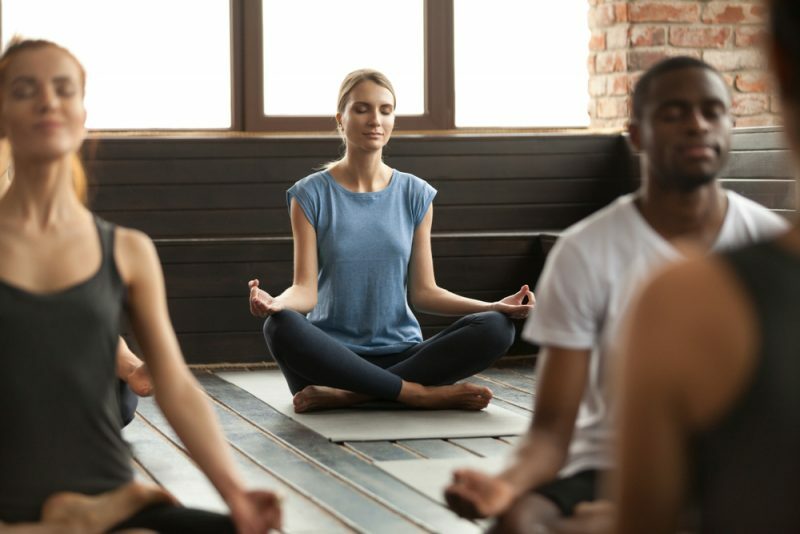 Even though there are many different schools and styles of yoga to choose from, many will have common names and poses that will get you into the flow of the class no matter where you lay down your mat. Here are 20 must-know yoga poses that you can practice in your daily or weekly yoga routine that will help you no matter what your body type, medical, emotional, or physical condition, and no matter how long you’ve been practicing yoga – be it a day or 30 years – these poses will always have new layers to show you about yourself. Many yoga teachers will describe Savasana as the most important pose from all the thousands of poses – and that’s because it is! Savasana, or Corpse Pose, is more than just laying down with eyes closed at the start and end of a yoga class. It represents emptiness, endings, as well as new beginnings. Savasana is when you can completely relax your body and scan it at the beginning of the session to internalize your practice and be mindful or any blockages or resistances that are present and unique to your own body at that present moment. At the end of the class, Savasana also allows the body to enter a state of rest, rejuvenation, and healing. So it is the pose when the most benefits are sown from your yoga practice. Balasana, or Child’s Pose, is a pose that yoga teachers will often prescribe if you need to take a break at any moment during the class. It is a restful posture that allows you to recenter your breath, body, and even thoughts and emotions. A restorative and relaxed version of Balasana is practiced by keeping the big toes together and separating the knees almost as wide as your mat if your flexibility allows. As long as you have enough space to fold forward as much as you comfortably can without letting your sit bones lift from your heels. Visualize your chest and forehead melting into the mat and allow your arms to relax either by your side or outstretched on the mat above your head. Feel free to close your eyes and lengthen your breath to slow down your heartbeat if you are using this pose to recover from a particularly strong vinyasa sequence. 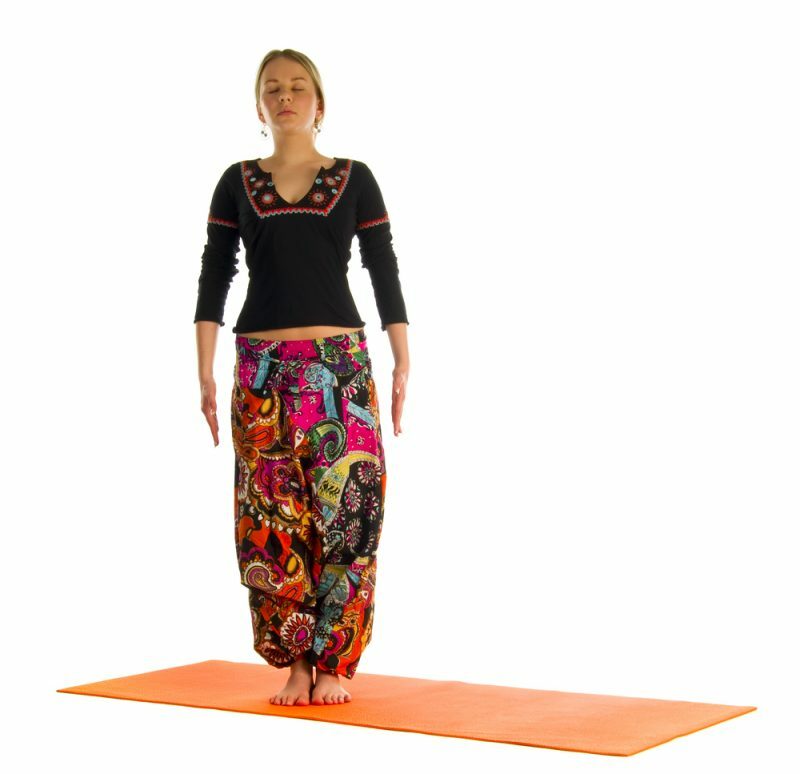 As its name suggests, Tadasana, or Mountain Pose, invites you to embody the strength and height of a mountain. With your feet solidly connected to the earth, your spine straight, shoulders away from the ears, and the crown of your head energetically reaching upwards towards the sky. Either keep your palms facing forward, relaxed by your side, or in Namaskar mudra with the palms facing each other in front of your heart. Some yoga schools will have you position your toes and heels together, some will say the toes should be together and heels just slightly apart, while other will say that for proper alignment in Tadasana, your heels should be placed directly underneath your hip bones as you stand. The most important part of any of these suggestions is to find the strongest connections within your own body to the ground evenly through the soles of your feet. Most of us were able to sit cross legged on the floor so easily as children. But the norm of the modern urban world is to sit in a chair whether we are working, eating, or travelling. So many of us have lost the flexibility in our hip flexors to remain seated in Sukhasana for extended periods of time, if at all. But Sukha in Sanskrit is literally translated as “ease” therefore this should be one of the most comfortable and natural poses to practice in yoga. It’s great for meditation because the body can relax while still staying upright without falling asleep. Sit on a block or place blocks or pillows under your knees according to your comfort and flexibility level as needed. Standing forward folds can help relieve tension in the lower back and sacrum, release the spine and neck, and stretch the hamstrings. If your hamstrings are too tight that you cannot touch the floor with your fingers, place blocks by your feet until the height that you need, or feel free to bend your knees as much as you have to so that the palms of your hands can stay flat on the ground. Half forward fold is sometimes also called the “Seven Pose” because you almost form a number 7 with your body when you practice this asana. As you lift up your torso from a full forward fold, keep your core engaged, legs strong, and spine straight. Imagine that you can draw a horizontal line from the crown of your head to the tip of your tailbone. Either keep your fingertips on the floor, on a block, or transfer your hand to your shins of below your knees, depending on your personal anatomy and flexibility level. When practiced properly, Chaturanga Dandasana, or Eight Angle Staff Pose, is one of the few yoga poses which will activate the pulling motion of the arm muscles, rather than pushing. It is so important to ensure that your shoulders do not go below your elbows in this asana so that you reduce the risk of injury to your shoulder girdle. Bhujangasana, or Cobra Pose, both strengthens the arms and neck muscles while keeping the spine soft and flexible. It is a great follow-up to Chaturanga Dandasana in a Surya Namaskar, or Sun Salutation, vinyasa sequence because it helps to counter the over-rotation of the shoulders and relieves them from the muscular action needed to hold the pose. The elbows are not completely straight and locked in Cobra pose. They should keep a slight bend and the shoulders should roll back and together, feeling an extension in the neck. Downward Facing Dog can be a strong pose when you are just starting a yoga practice, but in time, it can be a great resting pose in between stronger asana in a vinyasa class. Many people struggle most in this pose due to tight hamstrings. But take it easy on yourself and let your knees stay bent and heels off the floor. It is more important to keep your spine straight in Adho Mukha Svanasana. Keep your abdomen relaxed, creating almost a suction in your diaphragm as you push your chest towards your thighs. Your fingers should be as wide as possible to have a better grip on the mat, and your tailbone pointing up towards the sky without arching your spine. Virabhadrasana 1 is the first in a series of asana named after the warrior Virabhadra. The Sanskrit name of the pose literally translates into English as “Hero Friend Pose.” This lunging pose is practiced with both hip bones facing the front, light the headlights of a car. The knee of the front leg should never extend past your toes and in time you will develop strength to create a right angle with your calf and your thigh. Keep the heel of the back foot on the ground with the toes around 45 degrees outwards for stability. Raise your arms over your head and look past your fingertips, without compressing your cervical spine. The second warrior pose is said to represent the warrior, Virabhadra, sighting his enemy an preparing for battle. You need to adjust your stance so that your hips can open up and your arms can extend out in opposite directions. Keep your palms either facing up or down and at the same level as your shoulders. Look over your front fingertips. Imagine gathering energy from the earth through the soles of your feet and shooting the energy outwards through your fingertips. Anjaneyasana, or Crescent Lunge, especially the High version, can look deceptively similar to Warrior 1 pose. But there are differences that give it unique benefits from Virabhadrasana. Practice Crescent Lunge pose by keeping your back foot straight as your push your hips towards the from and downwards towards the floor at the same time. But do not force your front knee to deepen into the pose too quickly. You can always keep your palms on the floor for support instead of above your head as you gain strength and stability in the lunge. If you feel any pain in your knees, come out of the pose as quickly and comfortably as possible to avoid unnecessary injury. Tree Pose is one of the first balancing poses introduced to beginners starting a yoga practice. Balancing poses are a great way to stay mindful and to check if you are focused on the present or getting carried away by thoughts outside of your mat. Whether you are able to bring your foot all the way to your inner thigh, on your calf underneath your knee, or with your toes maintaining contact with the ground for stability, try to keep equal pressure between your foot and your leg pushing against each other. Once you begin to get more comfortable in the pose, try closing your eyes to challenge your balance, or even start getting into the pose with eyes closed from the very beginning. Knee to Chest is a great pose to relieve tension in the lower back and core after a strong Hatha or Vinyasa series. Keep the pose restorative by not actively pushing or pulling your knees and just hold them with interlaced fingers or hugging your opposite elbows to keep them in place. Allow your body itself to open up the pose when it is ready with no need to force your muscles and joints into any particular shape. Gently rock from side to side and forward and back to give your back a gentle massage while in this asana. Squatting is such a natural and healthy way for humans to sit. But many people who live in cities and developed countries are so used to chairs that squatting is uncomfortable and even painful for extended periods of time. But squatting is beneficial, not only for hip flexor flexibility, but it also stretches the quads, releases the lower back and sacrum, and may even help those who suffer from hemorrhoids. Not all bodies are alike though and some people may have bone structures that simply won’t allow them to go into a Full Yogic Squat. To counter this, simply sit on a block, or stable stacked blocks to the appropriate height so keep your buttocks as low to the ground as possible without causing pressure pain in your hip sockets. Dandasana, or Staff Pose, is very similar to Ardha Uttanasana, except instead of a standing position, the number 7 shape is created while sitting down with legs extended towards the front of the mat. Ensure that your spine is straight and the crown of your head is reaching up towards the sky in this pose. Life your knee caps without locking out your extended legs and keep your core engaged to hold up your upper body. Roll your shoulders back and together away from your ears, and keep your arms straight at your sides with the palms flat on the mat if your arms are long enough to reach while still keeping your back straight and strong. A strong, properly practiced plank, is the gateway to all other arm balances in yoga. For many who are just starting, maintaining balance in plank can already be a challenge and it begins to strengthen both the arms and the core for more intricate asana. Ensure that your spine is straight and not arching upwards or downwards and keep pushing the floor away from you to ensure that your shoulders are not collapsing. Keep pushing your heels towards the back to maintain length and strength from the crown of your head all the way down to your feet. Maintain steady, long breaths with the core engaged and look down, in between your hands to prevent strain and compression in your neck. Seated twists feel amazing in the body towards the end of a yoga class. They allow the body to release any remaining tension and realign the spine. Twists are also said to aid in digestion and gut health and may also help with constipation issues. Keep your back straight so that your vertebrae are stacked as you twist and do not round your back. Before fully going into Savasana at the end of your yoga practice, try laying down in Supta Baddha Konasana for a few minutes first to completely open up the body for even deeper relaxation and openings both in the hips and the heart. Use pillows, blocks, or folded up blankets underneath your knees for support as needed or even use a strap. Get to know these 20 yoga poses and you’ll already be on your way to a solid foundation in your yoga practice that targets many areas of the body for health, balance, and overall wellness. No matter what your age, body type, or fitness level, these poses will help you get started in yoga so you can flow into any class you attend.